The theme for this month's My Favorite Things Birthday Project challenge is candles, cake, and cupcakes. I thought that this sweet cake-toting bear would be a perfect fit for the theme! 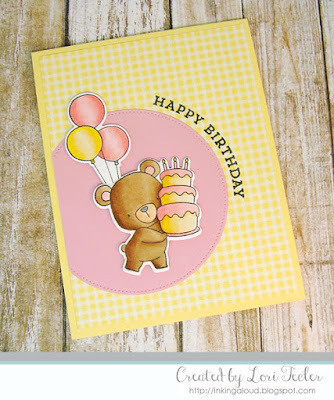 The bear and balloon images were colored with Copic markers and cut out with the matching dies. I used foam tape to adhere the bear image to a pink pierced circle die cut, then tucked the balloons behind it. After adhering the circle to a cheery yellow gingham patterned paper panel, I trimmed off the edge of the circle so it was flush with the panel's edge, then adhered the panel to a coordinating lemony yellow card base. For the sentiment, I stamped the curved "happy birthday" sentiment from the Make a Wish set along the edge of the round panel in black ink.